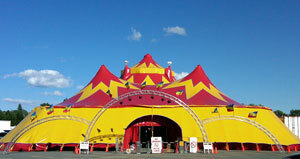 The WaWa Shrine Circus will be held May 27-29 in a tent outside Lawson Heights Mall. You may buy tickets online or at the gate. Children under 5 are free. Other tickets bought online should be $13. General admission tickets at the gate will be $15. Friday, May 27 ~ 4:15 p.m. & 7:30 p.m.
Saturday, May 28 ~ 12 p.m., 4 p.m. & 7:30 p.m.
Sunday, May 29 ~ 2 p.m.